Another fine turn out by the Stan Army for the 6th consecutive away game, this time at Durham City’s temporary home at Consett. The Stan, looking to build on 2 wins in a week, were unchanged. The home side, who were relegated last season and lost their home ground and many experienced players, were mainly made up of talented youngsters but did include player-manager Chris Moore and the experienced Sam Norris and David Luke. Durham kicked off and immediately got their passing game going on the 3G pitch but it was the Stan who took the lead with their first attack on 5 minutes. A superb flicked lay-off from Dan Robinson on half way released Sam Walton who had a touch before playing a return to Robinson who broke clear before dinking a finish over Gladstone in the City goal for his 5th of the season. He has now scored in 4 consecutive games. Durham rallied and the Stan struggled to get to grips with their movement but despite forcing 5 1st half corners and playing numerous other balls into the Stan box, Smith and his defence held firm. Luke though should have equalised when shooting over when well placed on 26 minutes. At the other end the keeper was out sharply to block Robinson and made a fine save when Walton’s shot was deflected off Robinson. The 2nd half started in the same manner with City dominating possession without creating too many clear cut chances. Again Smith was dominant in the air with Leighton outstanding at the back. Durham had another 5 corners in the 2nd half which came to nothing whilst Walton poked into the side netting and was closed down when trying to check onto his right foot when he was clear in the box. On 81 minutes, the Stan nearly increased their lead when Leighton’s header from a Shane Jones free kick hit the post. 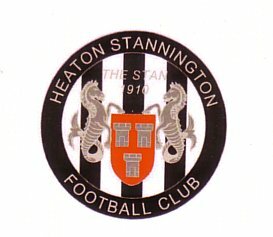 All that was left was for referee Malton to anger the Stan Army by playing an excessive 6 minutes stoppage time which the lads saw out without any real danger. This was a brave, battling display from the Stan (again) against a bright and inventive City who surely would have won if they had a decent forward. Again Smith, Leighton and Scott were outstanding and were ably supported by the rest of the team who worked so hard to keep a 2nd consecutive clean sheet. The win put the Stan on 10 points and up to 11th in the table. The excellent Diane, of Consett’s catering team, fed and watered the lads and the Stan Army and even convinced Boyla to have seconds of her Sausage Casserole and chips. Stan Team: Smith; McCabe (Y); Philipson (Y); Leighton; Scott; Bailey; Antony; Imray; Robinson (Yates); Walton (Jones); Dixon. Unused subs: Williams; Johnson; Bynoe.